Homeless Link and AVA are working together to explore how gender and trauma informed models can support women experiencing homelessness. and that both sectors have identified that homeless services need to do better at understanding the violence and abuse women face. 32% of the women they work with said that domestic violence contributed to their homelessness. (St Mungo’s Rebuilding Shattered Lives). St Mungo’s calls for homeless services to be gender and trauma informed. In addition to the evidence provided by the Rebuilding Shattered Lives report the recently published national rough sleeping figures show that 14% of people found rough sleeping on a single night were women. This is only the tip of the iceberg and research by Crisis, St Mungo’s and the Women’s Rough Sleepers Project highlight that many women do not sleep visibly and are in a hidden homeless situation. Nelson Trust on their trauma informed model of supporting women. Kings College London on research from the USA on addressing trauma and substance use. St Mungo’s on using psychotherapy with homeless women. AVA and Solace Women’s Aid on their work on creating psychologically informed environments in refuges. Trauma informed approaches are models that recognise the trauma that people have faced in their lives and structure systems around recognising and responding to that trauma. AVA and Agenda have recently published a literature review on core components of trauma informed models. At the core of recommendations are that responses must foster systems that enable internal safety for service users. Thus, the Nelson’s Trust highlighted the importance of identifying people’s triggers and threats so that you are creating spaces where people are able to feel empowered. Similarly, AVA and Solace Women’s Aid spoke about the importance of a whole systems approach where every worker, including senior management reflect on and understand their own trauma responses. The need for senior management to have training on trauma informed approaches. The need for homeless services to have specific training and awareness about what a gender-informed service should look like. 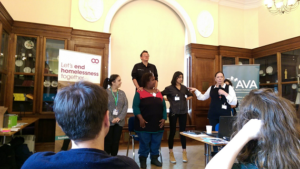 Better partnership working between VAWG services and the homeless sector. The need for service user involvement to be at the heart of this work. The need for better data collection and evidence on the needs of women experiencing homelessness. The need for joined up campaigns and policy work to lobby for greater resources and specialist support services for women with multiple and complex needs. 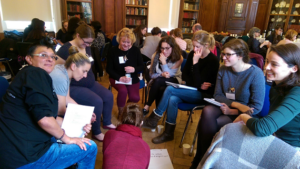 Beyond any doubt was the enthusiasm and appetite for more support developing trauma informed approaches for women and for the support sectors to work together in implementing these across all services. Whilst 60 people attended the day there were a further 50 people on the waiting list, a clear indicator of the need for this support and joint sector approaches. 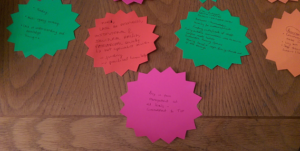 Homeless Link and AVA will be working together to address the recommendations made during the workshop, focusing particularly on ways in which the sectors can collaborate to better support women experiencing homelessness who are victims of violence. Watch this space for upcoming resources, training, and events on providing gender responsive trauma informed approaches for women! Sign up to our newsletter, follow us on Twitter and/or LinkedIn to be kept informed. Visit Homeless Link for further information and resources. Thanks to London Councils and Trust for London.